2017 has been a busy, busy year for both BW and myself, and booking a holiday was the last thing on the both of our minds. Come June and it was evident that I, sorry we, needed a break from everything, and as we could only manage a few days, our holiday destination had to be somewhere exotic yet not a million hours away. After a couple of hours of researching, we clicked book and a few days later we were en route Marrakech! 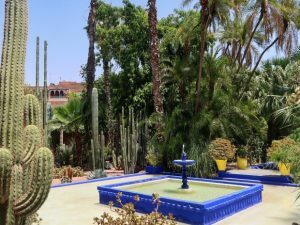 Getting to Marrakech entails a short 3-hour direct flight from London Gatwick via British Airways. Having woken up early to get to the airport, we were tired and grumpy (basically, me), and upon landing, the intense Moroccan summer heat just added to that. Luckily, we spotted our driver as soon as we exited the terminal and practically ran to the air-conditioned car. 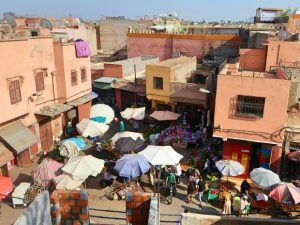 For a traditional Moroccan experience, it is advised to stay in a riad in the medina, especially if its your first time. 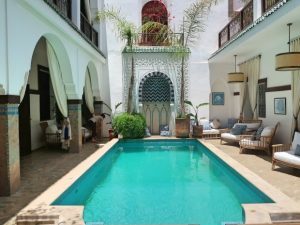 A riad is a traditional house that has been built around a quaint and pretty courtyard, and is ideal for hiding away from the busy streets. For the first leg of our trip, we opted for Riad Dar Al Farrah. It was a cute boutique riad, and we had a room right at the top to overlooking the courtyard. However, I was unimpressed to find that the manager had conned us into thinking he had “upgraded” us, when in reality gave us the most sub-standard room in the hotel. We then moved to La Sultana for a couple of nights. Now this is what you call an upgrade! 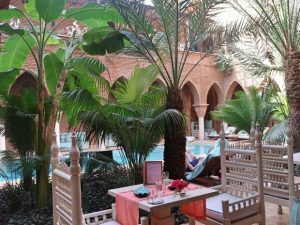 Not only do the staff treat you like royalty (my childhood princess dream had finally come true), the hotel grounds were simply outstanding and you couldn’t believe that beyond the walls were the busy streets of the medina. 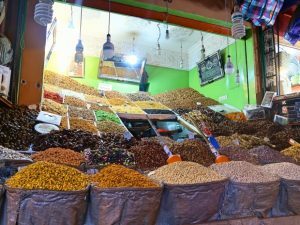 To really soak up the atmosphere of this vibrant city, we headed straight to the Djemaa el-Fna (translates to “assembly of the dead”) which comes to life as evening approaches and is full of snake charmers, numerous street food vendors and story-tellers. 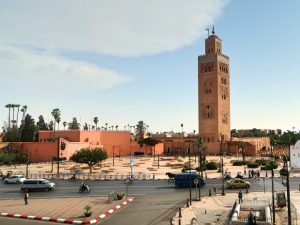 The Koutoubia Mosque, the largest mosque in Marrakech, is worth a visit and the surrounding gardens are ideal for people-watching. The Bahia Palace and Palais El Badi are situated just close by, as are the Saadian Tombs. 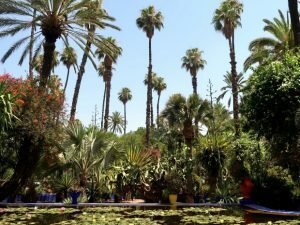 Jardin Majorelle, also known as the YSL Gardens, is jaw droppingly beautiful, and a must visit. Yves Saint Laurent took over the ownership in 1980s and after he passed, his ashes were scattered amongst the deep blue and green landscape. 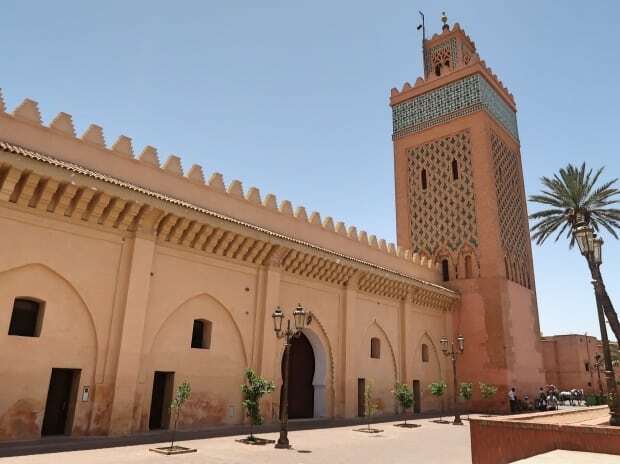 It is also home to the Musee Berbere; a showcase of all types of ancient artefacts, with a heavy focus on clothing and traditional jewellery. After a few days, I became a little restless. I needed some adventure, some adrenaline, just something, so I booked us in for an excursion of the Atlas Mountains. The driver zipped through the roads of Ourika Valley before we made it to our destination, and boy oh boy, it was not an easy trek up. By the time we descended the mountain, BW was battered and bruised, whilst I was in need of a massage. I’ve had my fair share of massages, from traditional bone-cracking Thai to relaxing aromatherapy, but I’ve only ever fallen asleep twice on the table; both times this trip! 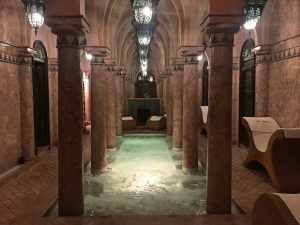 Although Marrakech are known for their traditional hammams, where you’ll endure a full body head-to-toe scrub with black soap, it is rare to find a non-segregated traditional spa out there without having to visit a hotel. 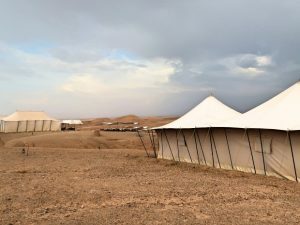 On the final two days of our trip, BW whisked me away to the desert for a spot of glamping (yes, luxury camping!) at Scarabeo Camp. With no wi-fi or any electricity, it is the ultimate getaway from everything and everyone, but I’ll tell you all about it in the next post! 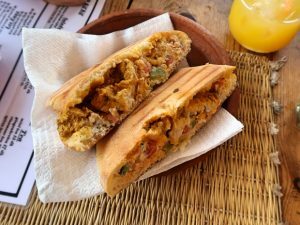 As Morocco is a Muslim country, the halal food scene was heaven to me! 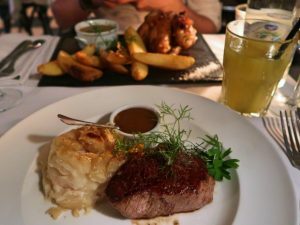 Just be sure to double check no alcohol is used in the preparation of your dishes when ordering. 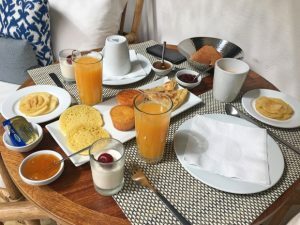 The typical Moroccan breakfast that you will be served consists of msemen (semolina pancakes), freshly squeezed orange juice, eggs, and a whole load of carbs! A heavy but delicious way to start the day. 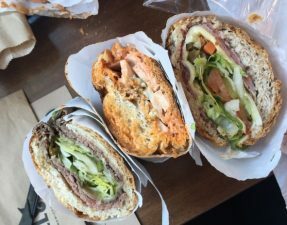 For lunch, you can pop into one of the casual eateries dotted around the main square, and some of the more notable ones are Roti D’or, Bakchic Cafe, Cafe des Epices, Cafe Kif Kif, and Cafe Clock (famous for their camel burgers!). Dinner can go both ways in Marrakech. For a more traditional Moroccan experience, you can head to Al Fassia (their lamb shoulder is an imperative order! ), as well as Amal. 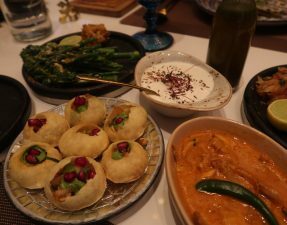 Alternatively, you can opt for a more modern taste of the Moroccan cuisine, and head to fusion restaurants like Nomad, Terrase des Epices, and Pepe Nero. 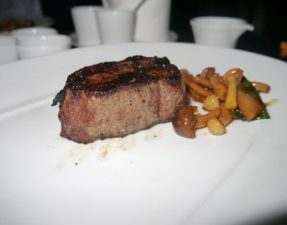 If you’re after a really fancy meal, La Mamounia is home to a 2 Michelin starred Italian restaurant, L’italien. Be sure to head to the hotel a little earlier for a mocktail before dinner so you can really soak up the pretty grounds. 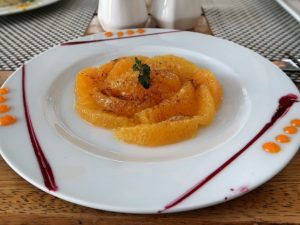 Now I have to tell you all, the oranges in Morocco are just fantastic; I’m not sure what in those things, but I’m just about getting over my withdrawal symptoms. The mint tea is also something magical and although the weather can be blistering hot, a hot drink also really quenches your thirst. Six days passed, and just like that, we were en route MAR airport to catch our flight home – our little getaway from the world was over before it even started. Deep down, I was glad to be coming back to grey and cool London, it was time to face reality instead of running away from it, and I don’t think my skin could become anymore sunburnt than it was already! —> At least, 99% of the locals in the Medina, especially the square, will harass you for money. REFUSE everyone, even the snake charmers and monkey carers (except if you want to take a photo). —> If you become lost, please ask for directions from inside a store or restaurant. Locals on the street will approach you and offer to show you the way, but will instead lead you the wrong way into the dark alleys and ask for money. It is worth downloading an offline map from Google to guide yourself around. Do NOT follow the locals! 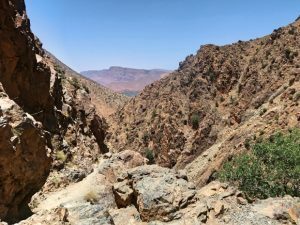 —> Pack a pair of comfortable shoes as you’ll be walking around a lot, plus a pair for if you climb the atlas mountains. Thank you for the tips. Good timing as we are off to Marrakesh on a family holiday this August. Yup, it’s going to be super duper hot! We had temperature of 35+, but because we kept ourselves busy by doing activities and spas, we did not even notice the weather – just avoid chilling out by the pool between 12-3pm! Also, keep hydrated with their amazing orange juice!